This chapter discusses the concept knowing, which involves knowledge in action, and learning, which involves knowledge in motion. We look first at knowing and learning in the organization and then examine the tension between learning and doing. 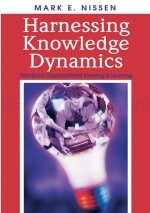 The discussion then turns to dynamic interaction between knowledge-enabled action and potential. The chapter concludes with five knowing and learning principles and includes exercises to stimulate critical thought, learning, and discussion.